Experienced and professional security service providers can help you mitigate the risks that come with crowds. 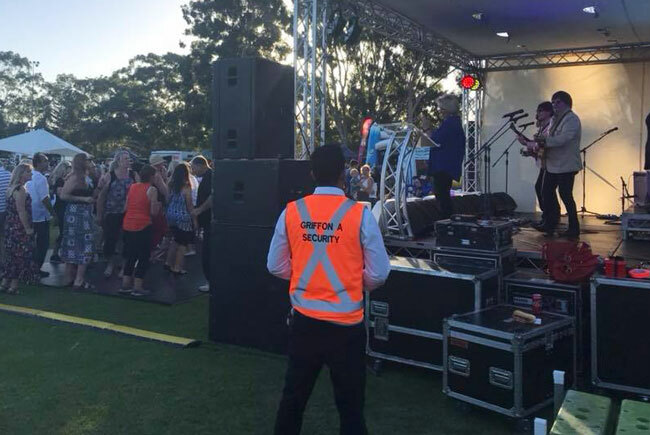 Griffon Alpha Group is one of Perth’s and Sydney’s leading providers of Crowd Control Service. We specialise in crowd control management procedures, crowd control methods and techniques, as well as security risk management. We have built an outstanding reputation for choosing only experienced, reliable and effective Crowd Controllers. Gathering a crowd for your event bears a certain amount of risk, the extent and severity of which depends on factors such as alcohol, possible drug consumption, unwanted guests, probable acts of terrorism and other unforeseeable emergency situations. If left unattended to, these may result “Red Alert” levels of risk. Experienced and professional security service providers can help you mitigate the risks that come with crowds. Griffon Alpha Group’s Crowd Control Team members are friendly, approachable and have great communication skills, but make no mistake. They are trained, licensed, uniformed, highly skilled professionals. Our employees are experts in quick identification of potential threats, allowing them to proactively minimise risk and eliminate potential hazards. Our Crowd Controllers undergo consistent training to develop their rapid risk response capabilities for the most challenging situations. Griffon Alpha Group supplies Security Officers and Crowd Controllers equipped with gadgets that may depend on the client’s requirements and the nature of the event. These tools may include: two-way radios, voice or video recorders, mobile phones, and hand-held metal detectors, among others. Our personnel also wear professional uniforms such as business suits and ties, hi-visibility vests, marked jackets, plain collar shirts and black pants, as well as casual-looking undercover-type uniforms meant for mixing in with the crowd.